Hanoi (VNA) – More than 37.4 million shares of five companies will be sold on the Hanoi Stock Exchange (HNX) this month. The firms consist of Hung Yen Urban Environment and Public Works Co., Ltd., Thuan An Coffee Company, Saigon Bank for Industry and Trade (Saigonbank), Thanh Hoa Water Supply JSC, and Yen Thanh Waterworks Management Board. 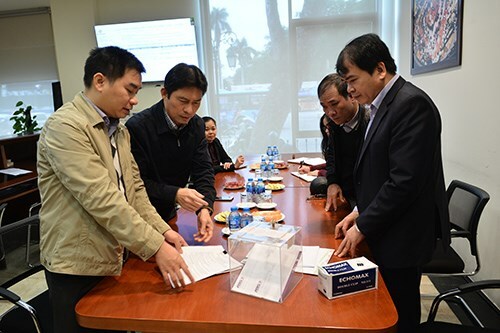 In March, three auctions to divest state capital from LILAMA 69-1 JSC, LILAMA 18 JSC, and Viglacera Corporation were held on the HNX, along with the initial public offering of the Central Pharmaceutical JSC No.3 (FORIPHARM). More than 83.9 million of shares were put up for sale, of which 73.2 million shares were sold, equivalent to 87.2 percent. More than 1.73 trillion VND (74.63 million USD) was collected from those auctions alone. Meanwhile, two other auctions selling shares of Bao Viet Hotel and Tourism JSC and Hanoi Audio Visual Company (Havisco) raked in more than 23.7 billion VND (1.02 million USD). Hung Yen Urban Environment and Public Works Co.